Dissident Bodies is a live and video performance event at Tattooed Mom, organized by Salomé Cosmique and Verónica Ponce de León, presenting the work of 17 artists from Latin America, France, India and the United States. Their varied responses to self-image and acceptance of ones body are at the center of this performance. These talented male, female, and gender non-conforming artists will share their ability to accept their bodies, and how in doing so, they have fractured the societal conventions which regulate and restrict us through expectations of gender and beauty. Dissident Bodies seeks to empower both the artist and the audience to accept their bodies as they are. It is often difficult to accept ourselves as time passes and our bodies change. Forming wrinkles, gaining weight, growing white hair, transitioning (or choosing not to transition) for one’s gender identity, giving birth and accommodating new life. These changes are a part of life, but we are encouraged to hide them. 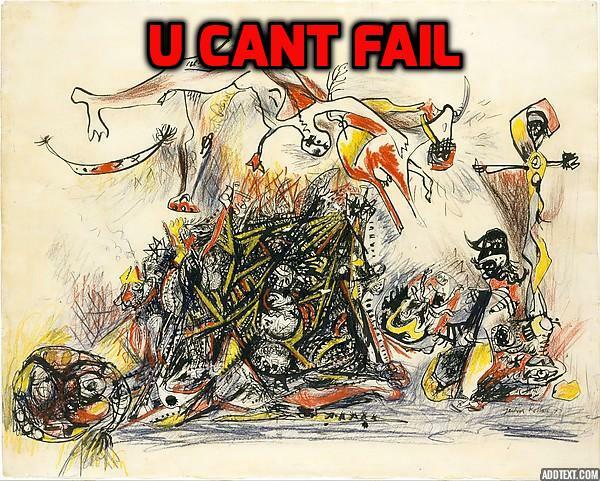 ANY and ALL art will be presented at this second installment of You Can’t Fail. First time performers to seasoned veterans are welcomed onto the stage to perform new works including: painting, photography, theater, dance, performance art, comedy, story-telling, poetry, prose, sculpture, ballet, film, stand-up…anything!